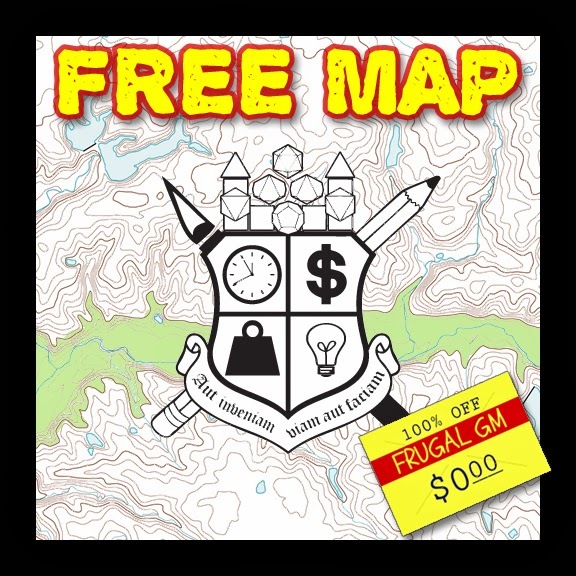 Instead of one free map, this week I am putting up a trio of free maps. Because they are all rather simple variations of a single theme: ambushes. 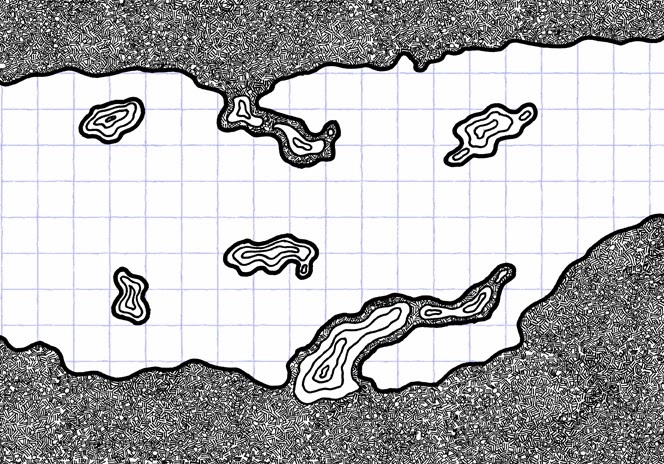 Last week's free map as a twofer encounter map, with the second encounter being a potential setup for the next encounter. That next encounter could either come across as a wandering monster encounter or it could be an ambush, all depending on how the party performed previously. Further along in the natural cave/tunnel complex there is a large chamber with various stalagmites and outcropping columns. A large band of monsters is on patrol through the area and would normally encounter the party at a reasonable range....possibly being surprised. If this group was alerted to the PC's presence they'd hide behind the various nooks & crannies to ambush the party. This map is also good just to plop down in front of your players for absolutely no reason at all....except to keep them on their toes. 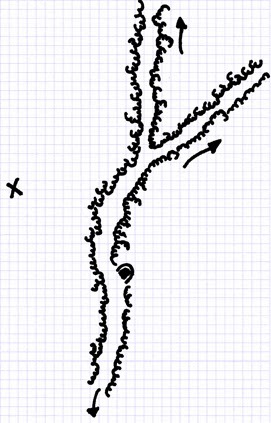 This map is a real simple trail map for when the party comes out of the caves. While I clearly remember this encounter, the setup was quite a bit on the simple side. There are realistically only 3 options for the party, and all are designated with arrows. I like this map because it is extremely simple. 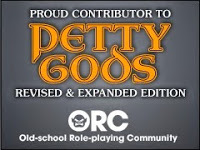 The idea wasn't to plot everything out but instead just make a simple recording of options that could help the GM run the encounter on the fly. This map was never intended to be shown to the players, hence the rather simple layout. Think of it as a slightly dressed-up flowchart. I had just a little too much fun with this map. It was another doubling of encounters, this time an ambush and a trap. As you can see with the scale, it is a long map. The X's designated adversary locations. The party is travelling uphill and can see where the tree-line ends. Since the trees are growing smaller and are otherwise sparse they can also see the mound of dirt on the side of the road. 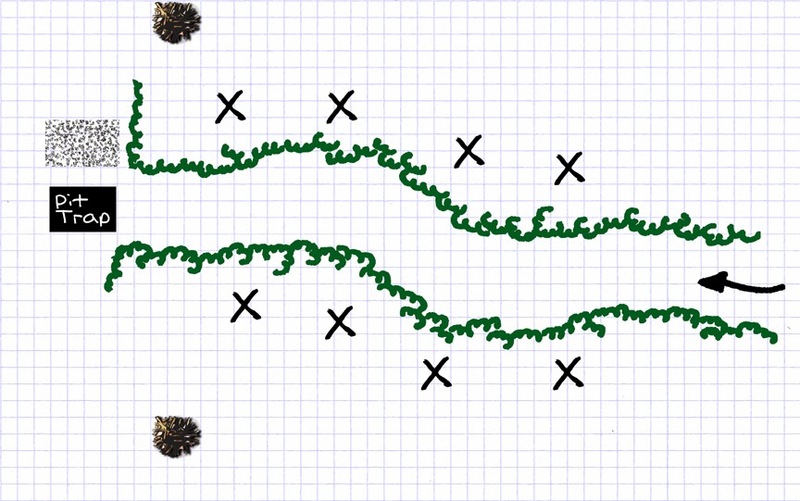 As the party approaches, teams of crossbowmen pop-up and start peppering the party.